On our West Yorkshire visit, our relative Christopher suggested dinner at The Stansfield Arms, a traditional English pub in the Apperley Bridge area of Bradford. As a local, Christopher knows this pub well enough to recommend it for people like us who don’t eat meat. These Yorkshiremen are meat eaters and when the menu came, I was quite relieved to find that they have a section for vegetarians. What’s more, the vegetarian meal options are really quite creative. 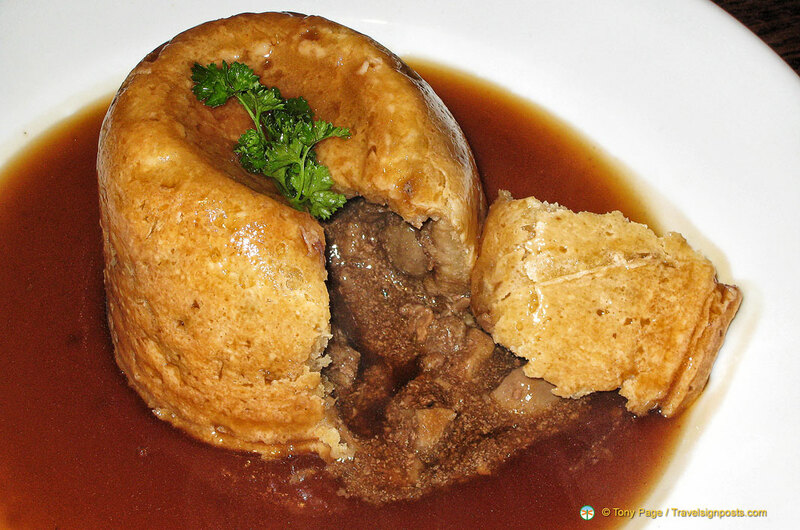 Amongst the five of us we had various dishes, but the one dish that made an impression on us at dinner was the beautifully prepared Steak & Kidney Pudding that Christopher had. Even as vegetarians, we appreciated this aesthetically created traditional English dish . And, whilst we admired the perfection of the dish, Christopher tucked into it with such gusto that we knew it had to be good, his only complaint being that it was very filling. The Stansfield Arms is a historic pub which dates back to 1543. This is one of three historic Yorkshire pubs owned by twin brothers Chris and Nick Green. The other two pubs are The Black Horse at Askwith and The Chevin Inn at Menston. There’s room for 120 diners at The Stansfield Arms any time, but the pub still manages to maintain its traditional features and atmosphere. On a warm summer afternoon, its beer garden is an ideal place to enjoy that lazy Sunday lunch. As can be seen from the few dishes above, the cooking style is creative and according to the owners they use locally-produced products.